What did I expect? A cute comedy about a sentient VW bug. What did I get? With a mise-en-scène not far removed from the campy Batman movie of eight years prior, Herbie Rides Again probably felt like a throwback the day it opened. The second movie in the sort-of-franchise kicked off by 1968’s The Love Bug, it’s easy to take but not very memorable. A precursor to Pixar’s Cars movies, Herbie Rides Again has something of that series’ essential ordinariness. Everyone can get behind Herbie, the headstrong white VW Beetle with the “53” on the hood, but as with many sequels, this one’s pretty rote. A bit like the Planet of the Apes series, one suspects that the essential mystery of the original was better left unprobed, but more on that later. Padded to fill 88 minutes, Herbie Rides Again mashes together four filmic modes codified way back in the 1910s — a conflict between plucky virtue and dastardly evil, a dewy love plot, sodden slapstick, and extended bits of overcranked montage. 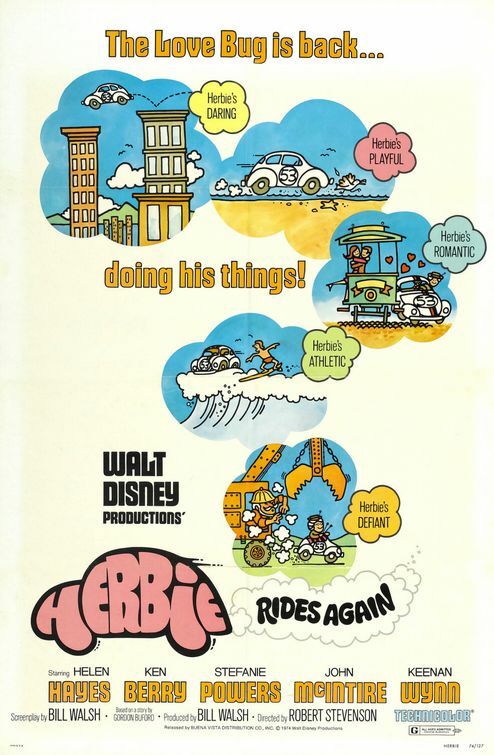 Evidence of Disney’s doldrums between the death of Walt in 1966 and the resurgence that started in the late 1980s, Herbie, alas, resembles the dreary Charley and the Angel more than the confident Robin Hood, both of the previous year. (The creakiness always showed in Disney’s live-action product.) Taken directly from The Love Bug, the movie’s strongest element is the groovy flutter-tonguing flute of the effervescent score. Herbie is now the property of Mrs. Steinmetz, aunt of “Tennessee” Steinmetz, the mechanic played in The Love Bug by Buddy Hackett, who’s funnier and more fully realized than anyone in Herbie Rides Again. Airlifted in from The Absent-Minded Professor and Son of Flubber, the rapacious and blustery Alonzo Hawk (Keenan Wynn) is intent on ousting good Mrs. Steinmetz (Helen Hayes) from the cute firehouse seen in the earlier movie, it being the only building for blocks that hasn’t yet been demolished to make way for Hawk’s imposing H-shaped skyscraper. Hayes reprises her Oscar-winning turn as a cute, amoral old lady in Airport, and the three other principals (hero, love interest, villain) are paler versions of their counterparts in The Love Bug. Gamely played by Ken Berry as a repository of takes, the hero Willoughby Whitfield is most notable for his cowardice; his gal Nicole’s feistiness may have been a sop to women’s lib. Memory has enshrined the Beetle as an emblem of the 1960s, but in reality it had existed in various forms as far back as 1938 — is it too scurrilous to point out that Herbie’s true father, the man who commissioned the “Käfer” from Ferdinand Porsche in 1933, is Adolf Hitler? That might explain Herbie’s will to chaos, fits of pique, vainglory, and (this is a family movie after all) steadfastness. (To be fair, his outsize personality does fit this kind of movie well.) Adorable and obscurely an underdog, the Volkswagen Beetle is the ideal vehicle for such anthropomorphism. The movie goes through the paces and delivers the requisite thrills and spills, but not without showing a little sweat. What here smacks of 1974? Not a lot. Even the “psychedelic” Beetle we see late in the movie feels a lot closer to 1968. IMDB synopsis: Alonzo Hawk is a mean-spirited property developer who has bought several blocks of land in the downtown district in order to build a gigantic shopping mall. There is one problem however; an elderly widow named Steinmetz won’t sell the one remaining lot that Hawk needs to proceed with his scheme. So he resorts to all manner of chicanery, legal or otherwise, to get it. Fortunately, the widow Steinmetz has an ace up her sleeve in the form of Herbie, the miraculous Volkswagen.